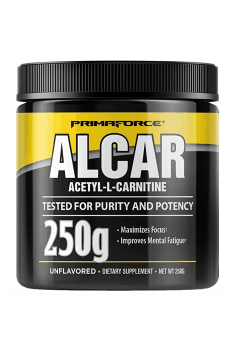 Primaforce ALCAR is a preparation containing acetyl-L-carnitine, which is an essential component in a number of metabolic reactions and memory processes. Its positive effect on the body has been proven by many studies. It helps to enhance exercise capacity, boosts its results, accelerates regeneration, and facilitates concentration. Acetyl-L-carnitine (ALC or ALCAR) is the acetylated form of L-carnitine. The compound is produced by the body but in order to maintain its proper levels, it is good to supplement it as well. The lion’s share of L-carnitine is stored in the muscles but it can also be found in the liver and the kidneys. Acetyl-L-carnitine is broken down to carnitine by esterases in blood plasma, and carnitine can then be used by the body whenever needed. The acetylated form of L-carnitine, unlike its simple form, exerts a stronger effect on the functioning of the central nervous system. Acetyl-L-carnitine is a compound that can be delivered to the organism with food; however, achieving visible effects without supplementation is difficult, as it is only found in products of animal origin, particularly meat. Because of that, ALCAR supplementation is recommended particularly for vegetarians or, even more so, vegans. A function that is extremely important from the point of view of physical activity is increasing acetylcholine levels in tissues. Acetylcholine is an important neurotransmitter in the central nervous system and on neuromuscular connections. Shortly speaking, its proper amount is necessary for the muscles to react appropriately to the strain they’re under and to develop properly. Too low a level of the substance makes the performance of muscle tissues less efficient and puts them at a higher risk of injury. Lactic and pyruvic acid formed during physical exercise contribute to the reduction of acetylcholine levels. Another factor that can decrease them even more are doping substances. Because of that, ALCAR is a great remedy for tiredness after workout thanks to its positive effect on restoring acetylcholine levels and, consequently, it helps to improve workout results. Moreover, acetylcholine promotes the production of beta-endorphins, which are painkillers secreted naturally by the body. They reduce the sensation of pain during training, which means workout can be made more intensive. High ALCAR levels may also reduce problems connected with sleep disorders. The presence of acetyl-L-carnitine promotes the production of acetylcholine, but not only. It has a similar effect on dopamine and serotonin. The neurotransmitters are responsible for switching the body into the state of alertness and improving the mood. That translates into a better mood and a sensation of wakefulness. Some studies point out that the beneficial effect of ALCAR on the nervous system helps to improve the ability of subjects to remember. In one of them, intravenous administration of ALCAR increased the speed of metabolism in brain tissues by 20% in 30 minutes. ALCAR supplementation gives better results in that aspect in middle-aged people, while in younger individuals it helps to slow down nerve cell degradation. By supporting the increase of neurotransmitters, ALCAR makes focusing on chosen areas of activity easier. The overall mood depends just as much on the fact that ALCAR can inhibit the production of cortisol, which is also known as the stress hormone. Thanks to that, it becomes a valuable asset in preventing anxiety and depression. A matter of great importance to the health of the body is the fact that ALCAR helps to maintain proper levels of cardiolipin, which plays an important role in the right functioning of the electron transport chain in cells. Shortly speaking, ALCAR prevents age-related drops in the availability of the compound, thanks to which it supports the process of cellular respiration and, in turn, improves the condition of the cardiac muscle and prevents disorders in its functioning. Apart from that, it reduces the negative effects of its potential anaemia. Studies also show the efficacy of ALCAR in reducing elevated blood pressure and improving the functioning of blood vessels. High ALCAR levels in the body can promote the use of adipose tissue as a source of energy for activity rather than glycogen or amino acids. Thanks to that, it can improve endurance by providing long-lasting energy boosts and, at the same time, it makes it easier to get rid of excess fat. In summary, Primaforce ALCAR is a supplement with a wide range of applications both in physical training and in improving intellectual performance. Supplementation can be recommended to all athletes. Those who prefer strength or speed training will probably notice an improvement of reaction to stimuli, while endurance athletes should experience a delay in the feeling of tiredness after, for example, a long run. When it comes to activity besides workout, the substance helps to focus on a specific activity or intellectual process, which can be particularly helpful in people suffering from ADHD. 1-3 scoops a day depending on the needs. Do not exceed 3 scoops a day. As a support for fatty tissue reduction, it is best to use 2-3 portions a day between meals, using also before training, especially aerobic. For improving health and brain functions it may also be used temporarily before the planned mental effort or continuously, preferably combined with ALA.